Owen Land (formerly known as George Landow) was one of the most original American filmmakers of the 1960s and 1970s. His works fused an intellectual sense of reason with the irreverent wit that distances them from the supposedly ‘boring’ world of avant-garde film. His early materialist works anticipated Structural Film, the definition of which provoked his rejection of film theory and convention. Having explored the physical qualities of the celluloid strip, his attention turned to the spectator in a series of ‘literal’ films that question the illusionary nature of cinema through the use of elaborate wordplay and visual ambiguity. The characters in Land’s films are often the antithesis of those we might expect to see, such as podgy middle aged men and radical Christians. He sometimes parodies experimental film itself, by mimicking his contemporaries and mocking the solemn approach of its scholars. Land constructs ‘facades’ of reality, often directly addressing the viewer using the language of television, advertising or educational films, and proposes an alternative logic for a medium that has become over theorised and manipulated. He has exposed the material of film and deconstructed the process and the effect, while covering the ‘big topics’ of religion, psychoanalysis, commerce and pandas making avant-garde movies. REVERENCE is a LUX project in association with Österreichisches Filmmuseum, Vienna. Curated by Mark Webber. Supported by Arts Council England. The films of Owen Land have been preserved by Österreichisches Filmmuseum, Vienna, in co-operation with Anthology Film Archives (New York), Haghefilm (Amsterdam) and Listo-Film (Vienna). Film stills © 2004 Owen Land & Österreichisches Filmmuseum, Vienna. All stills created by Georg Wasner. All uncredited quotations by Owen Land (formerly known as George Landow). With Fleming Faloon and Film in Which There Appear, Owen Land was one of the first artists to draw attention to the filmstrip itself. Films like Remedial Reading Comprehension and Institutional Quality question the illusionary nature of cinema through the use of word play and visual ambiguity. 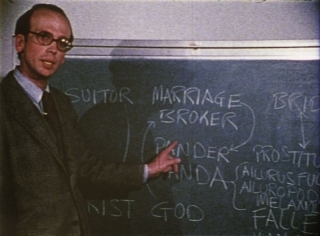 By using the language of educational films he proposes an alternative logic for a medium that has become over theorised and manipulated He often parodies avant-garde film itself, mocking his contemporaries by alluding to their work (and previous films of his own), and also by imitating the serious approach of film scholars. On the Marriage Broker Joke manages to combine Japanese marketing executives, pandas, Little Richard, Liberace and Freud. A cinematic equivalent to the illusionistic portraiture of the Flemish painters. In his first 16mm film, Landow proposes that if we accept the reality offered to us by the illusion of depth on the flat plane of the screen, we can then assign reality to anything at will. FILM IN WHICH THERE APPEAR EDGE LETTERING, SPROCKET HOLES, DIRT PARTICLES, ETC. The ‘imperfections’ of filmmaking, which are normally suppressed, are at the core of a work that uses a brief loop made from a Kodak colour test. “The dirtiest film ever made,” is one of the earliest examples of the film material dictating the film content. It may seem minimal, but keep looking – there’s so much going on. 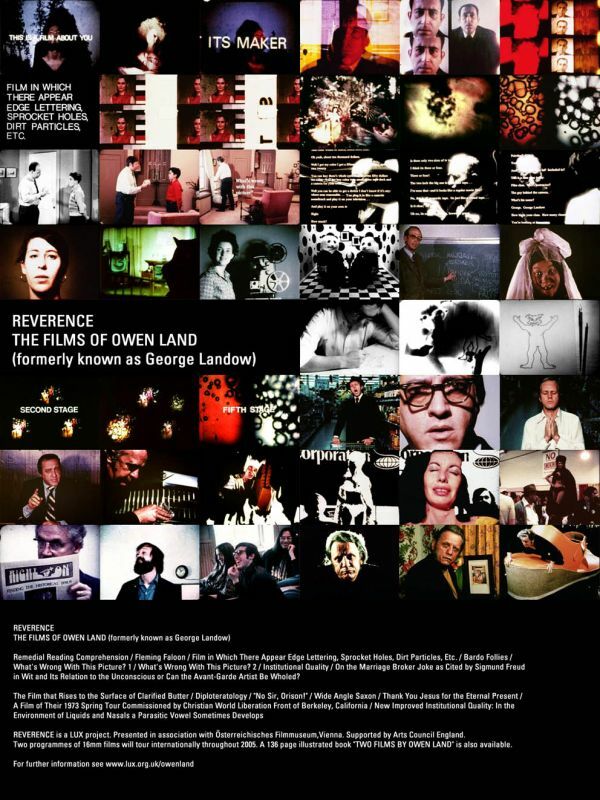 Owen Land (formerly known as George Landow), USA, 1971, b/w & colour, sound, 5 min. A found, utilitarian object, the overtly moralising educational film “How to be a Good Citizen”, is elevated to the status of ‘art’. 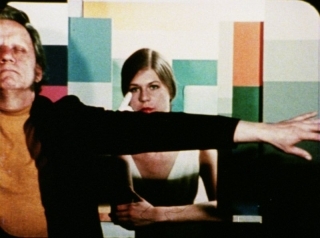 The film is first presented unaltered and then in Landow’s colour facsimile, which is further modified by applying an opaque matte that creates a spatial paradox. As Landow and his students were testing a new video camera, an elderly man began to talk to them about new technology. This impromptu conversation forms the basis for a comparison of spoken and written language. After being transferred to film, a transcript of the encounter is superimposed over the image. The film is constructed around a found soundtrack in which a strict female voice delivers a test of perception and comprehension. 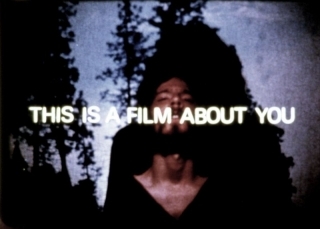 As this test continues, the relationship between sound and image becomes detached and they follow separate paths, a consequence of the filmmaker losing interest in his subject. ON THE MARRIAGE BROKER JOKE AS CITED BY SIGMUND FREUD IN WIT AND ITS RELATION TO THE UNCONSCIOUS OR CAN THE AVANT-GARDE ARTIST BE WHOLED ? Diploteratology was produced by burning celluloid to create abstract, organic imagery. As well as exploring the material of cinema, Owen Land has exposed film’s innate ability to transcend the moment and propose surrogate ‘facades’ of reality. In Wide Angle Saxon, an ordinary, middle-aged man undergoes a conversion experience whilst watching an avant-garde film, and in New Improved Institutional Quality, a similar character undertakes an IQ test which takes him deep inside his imagination. A sequence of works from the mid-1970s arise from the filmmakers’ inquiry into Christianity, but are far from evangelical. An illustrator is drawing figures that resemble Tibetan deities. He can’t believe his eyes when they appear to come to life and dance on the paper, taking on qualities we might associate with Disney characters. They appear trapped between 2D and 3D space, an eerie limbo which is amplified by the sinister loop of the soundtrack. After singing a vivacious song of love in the aisle of a supermarket, the performer kneels down to ask forgiveness for those involved in the commercial food industry, which substitutes natural produce with non-nutritious commodities. Orison means prayer. The title of the film (a palindrome) is the answer to a question. An interpretation of The Confessions of Saint Augustine, featuring an ordinary middle-aged man who undergoes a conversion experience whilst watching an experimental film. The film is by Al Rutcurts (think about it) and Earl is so bored that his mind starts to wander. He realises that his possessions may be a barrier between himself and God and determines to something about it. Owen Land (formerly known as George Landow), USA, 1973, b/w & colour, sound, 6 min. A rapturous audio-visual mix that “deliberately seeks a hidden order in randomness.” The film combines the face of a woman in ecstatic, contemplative prayer with shots of an animal rights activist, and a scantily clad model advertising Russian cars at the International Auto Show, New York. A radical Christian group’s lecture tour of US colleges was filmed in the cinema verité tradition, with hand held camera, sync and wild sound. To avoid making a conventional documentary, the filmmaker created a dynamic collage by stroboscopically editing together pairs of scenes using a rapid rhythm of three-frame units. The IQ test soundtrack is re-used in an entirely new work that is concerned more with the effects on the examinee, who enters a Chinese box of impossible perspectives in a hyper-realistic living room. He briefly escapes the oppressive environment of the test but passes into the imagination of the filmmaker, where he encounters images from previous films. “Reverence” is the first international retrospective of the work of Owen Land, one of the seminal figures, under his former name of George Landow, in the experimental film scene of the late 1960s and early 1970s. A pioneer of self-reflexive filmmaking, Land’s films question the illusionary nature of cinema through the use of wordplay and visual ambiguity. Land often parodied experimental filmmaking itself, while his use of found film footage, text, repetition, and loops parallels the Conceptual art practices that were evolving at the same pivotal moment in American art. “Reverence” consists of fourteen films, including early formative works that were subsequently revised or withdrawn. Wide Angle Saxon and On the Marriage Broker Joke as Cited by Sigmund Freud in Wit and Its Relation to the Unconscious, or Can the Avant-Garde Artist Be Wholed? will be screened continuously on video during Museum hours. Each weekend these two films will be shown once per day in their original format on 16mm film alongside new prints of Land’s other films. Please refer to the exhibition brochure for weekend program details. 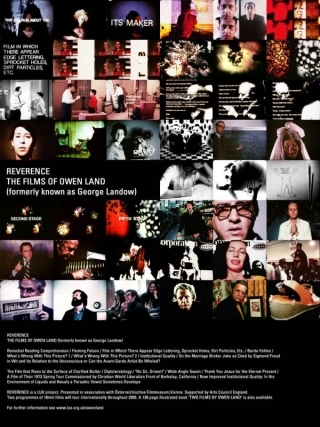 “Reverence: The Films of Owen Land (formerly known as George Landow)” is a LUX project in association with ÖsterreichischesFilmmuseum, Vienna. Supported by Arts Council England.